Building occupants, as one of the crucial project beneficiary will be involved throughout all stages of the project life cycle, and they are recognized as the main enablers of the HOLISDER innovation process, and aim is to encourage them to have active and collaborative contribution in development of a unique Demand Response ecosystem. Mutual two-way collaboration will be established as occupants will be encouraged to provide feedback and their comfort preferences to determine their flexibility for exposure to variable pricing schemes. Furthermore their experience in the Demand Response schemes by utilizing newly developed functionalities will be the focus of the development of user oriented personalized informative billing system. The Facility Manager, as service intermediary will be included in the development of viable business cases which will support its sustainability in the Demand Response era. Suitable tools will be applied that will allow them intuitive monitoring on the measured data streams as well as its role close to the building occupants in the DR schemes. They will be given opportunity to experiment with, validate and finally adopt new business models to act as Demand Response providers and introduce themselves into energy markets. Their responsibility as building operations they will evaluate the economic impact and manage maintenance activities. The aggregator accumulates flexibility from its portfolio in order to enable the participation of even small loads (as a pool) to the energy market, satisfying thus the minimum requirements for flexibility capacity. The Supplier accumulates elasticity from its portfolio, which will in turn enable him to implement demand balancing optimization procedures. Exploitation of cumulative energy consumption flexibility allows more flexible energy purchasing strategies to reduce average energy cost and improve profit margins. Consequently, HOLISDER will enable them better competitive position. The supplier role is to identify and categorize the overall price elasticity of his portfolio. By doing so, he is then able to implement dynamic pricing schemes that allow him to minimize portfolio imbalances. The role of Maintenance Company is to periodically check the status of the building equipment and to further increase the performance of high consuming demand assets and reduce unnecessary energy wastes in buildings. 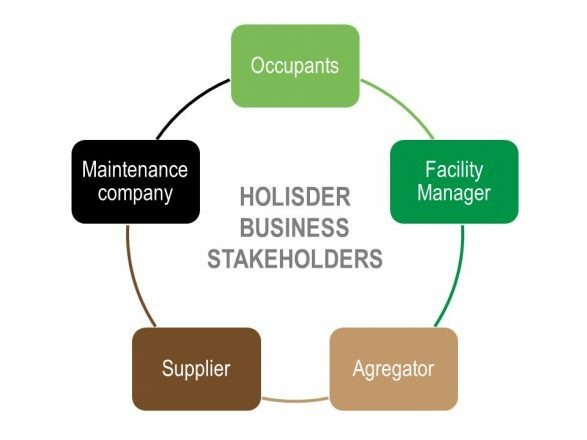 HOLISDER will deploy an algorithmic engine that will provide capabilities for systematic monitoring of equipment performance, detecting and diagnosing various mechanical faults or discrepancies, detecting anomalous behavior and defective equipment/ materials, identifying Indoor Air Quality (IAQ) violations and recommending optimized maintenance actions, which will be based on the prediction of future equipment performance.